Drutex S.A. - Pressroom - New Drutex products at the Munich trade fair. At this year Bau trade fair in Munich Drutex showcases its recent product solutions. At the 140-meter stand, the company has launched i.a. the MB-86 SI aluminum systems, PVC woodwork and roller shutters in a new color range, as well as Iglo-HS corner patio doors equipped with systems of smart control. The biannual BAU is one of the most important exhibition events in architecture as well as in construction materials and systems that attracts a huge number of exhibitors and visitors. Ca. 2 thousand companies from more than 40 countries present their offer during this year edition. 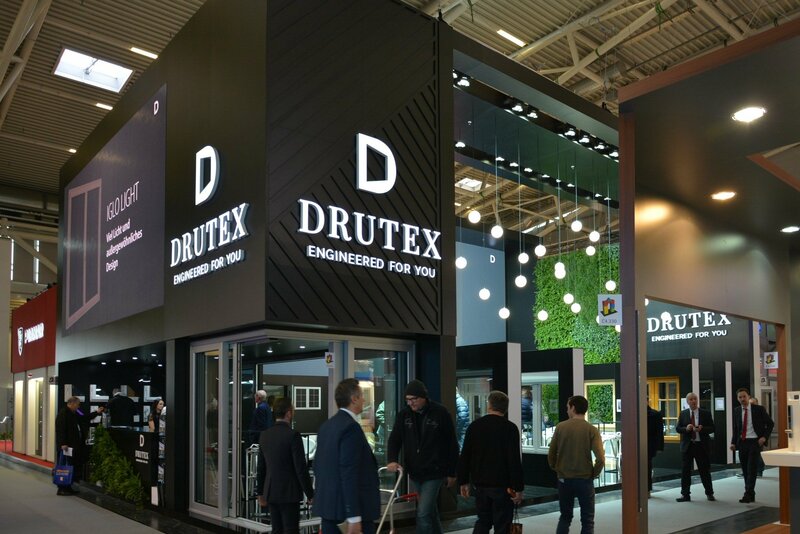 Drutex, for whom Germany has been the most important export market for years, presents at the exhibition its modern PVC, aluminum and wood systems. This year the company will surprise the Clients with the innovative MB-86 SI aluminum solutions and PVC solutions, as well as systems of smart woodwork control that are very popular in Germany. At the BAU exhibition DRUTEX will introduce its modern window manufactured in the MB-86 SI system. The MB-86 SI system, as a product that stands out for great parameters in energy efficiency and resistance, offers a lot of possibilities regarding modern architecture and design. Thanks to its great thermal properties and the minimalist design it may be used both for individual development as well as for aluminum facades. The profiles shape allows to obtain slender and stable windows and doors structures, and the special gaskets made of two-component synthetic EPDM: solid and cellular, guarantee resistance to aging during long-term usage and very good thermal insulation that is achieved thanks to the special profile structure and to the application of an extra chamber in the thermal break. The wide choice of colors in the standard range provides a huge spectrum of arrangements, which will satisfy the needs of most demanding clients. BAU also constitutes an opportunity to present the solutions that are highly popular on the German market, including the Iglo-HS system introduced in 2015. During this year exhibition the company showcases its patio system in the corner version that allows to design the interiors in remarkable and unique styles. The system, equipped with a smart method of door opening and closing, lets the clients appreciate not only the design, but also the functionality of the solution and its innovative advantages. At the same time, our stand shows external and adaptation roller shutters in the new Renolit film colors that the company launched in January, as well as PVC doors with new door panel models in modern color range. The wide Drutex offer is a highly popular solution perfectly tailor-made for the German market. The company will be happy to welcome its clients at the Stand 331 in C4 hall, between 16 and 21st January 2017. DRUTEX develops the products’ design!